Coast Guard Air Station Astoria recently received a yellow-painted Sikorsky MH-60 Jayhawk helicopter at its base in Warrenton, Ore., in celebration of 100 years of Coast Guard aviation. 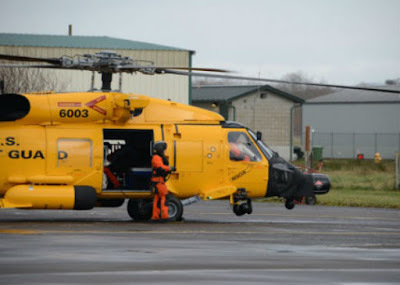 The Jayhawk helicopter, the first of all this year’s specially painted aircraft delivered by the Coast Guard to an operational unit, arrived from Coast Guard Aviation Logistics Center in Elizabeth City, N.C., and will operate out of the Warrenton base for the next four years. "We are honored to receive the first Jayhawk with a historic paint scheme and look forward to using it to continue the watch that our aviators so valiantly stand," said Capt. Daniel Travers, commander, Coast Guard Sector Columbia River. "This Jayhawk may look different than our orange and white ones, but its mission remains the same, to protect the mariners that call the Pacific Northwest home." The Jayhawk helicopter is painted yellow to represent the chrome yellow paint scheme that Coast Guard and Navy helicopters used in the late 1940s and early 1950s. The yellow Jayhawk helicopter is one of two centennial aircraft that will be stationed in the Pacific Northwest. 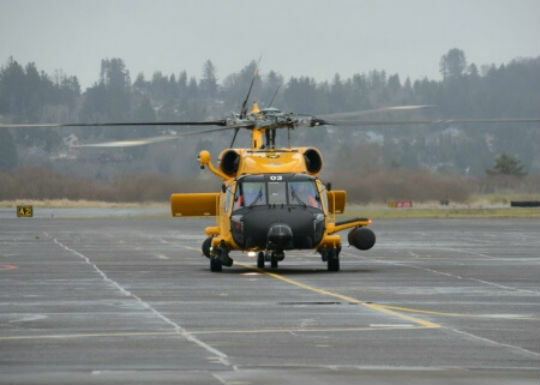 An MH-65 Dolphin helicopter is scheduled to be delivered to Air Station North Bend later this month. These two aircraft are the first of the 16 centennial painted aircraft in the country. Altogether, three different Coast Guard aircraft types, including the Jayhawk and Dolphin helicopters as well as the HC-144 Ocean Sentry airplane, are receiving historic paint schemes representing various eras of Coast Guard aviation. Coast Guard aviation officially began April 1, 1916, when 3rd Lt. Elmer Stone reported to flight training in Pensacola, Fla. The Coast Guard is celebrating the centennial of Coast Guard aviation throughout 2016, with a variety of activities honoring the accomplishments and sacrifices of the men and women throughout the past 100 years.